With the maturing of my taste buds, salmon has become one of my favorite proteins to cook with. I love how many flavors can be paired with it. I have made spicy salmon, sweet salmon and basically everything in between. This recipe is a great version of sweet salmon. 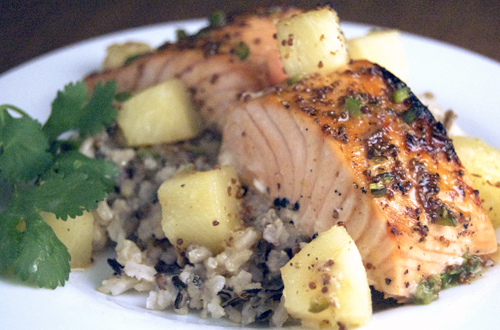 The sweetness of the maple syrup and the sourness from the pineapple add great flavor to the fish. This recipe is very easy to make and can be whipped up quickly on a busy weeknight. Heat a small saucepan over medium heat, whisk together the syrup and mustard and bring to a boil. Reduce heat and simmer until the glaze is slightly thickened (about 3-5 minutes). Remove of the heat and set aside. Line a baking dish with foil and place salmon inside. Sprinkle with salt and pepper, then scatter with pineapple chunks and jalapeño. Coat the salmon with the glaze and broil until the salmon flakes easily (about 5-7 minutes). 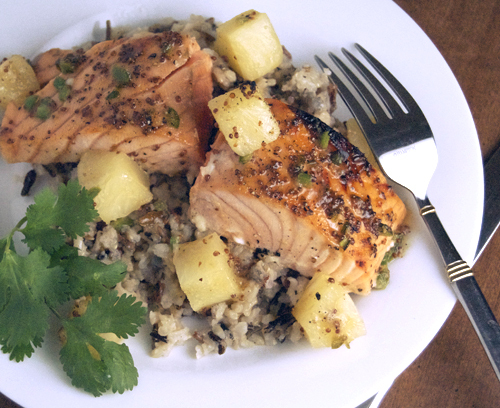 Serve the salmon and pineapple chunks over ½ cup rice each and drizzle with the leftover glaze. I always love the seafood, even as a kid…:-)) your salmon steak looks scrumptious! Great recipe! I am stumbling this! Salmon is my favorite fish and it looks really yummy. Wish I liked salmon! This looks like it would be a wonderful dish! What a great combination of maple syrup, pineapple and salmon! I am amazed!! I always love seafood, even as a kid. Your salmon looks wonderful. I’m starting to eat more fish these days so I’m looking for creative recipes to cook these suckers. YUM! I can’t wait to try this! My tastebuds find this recipe so fascinating. There’s sweet, spice and full-flavored fish so I really need to make it and give it a try. We might even toss it on the grill. This looks so delicious! Maple and salmon – the perfect best friends!!!! This looks so good! Love the flavor combos.